One of the things I dread about my little one growing up is going shopping without the infant seat. In his infant carseat he is protected from germs!! Bright Starts has helped solve that problem! Their Comfort& Harmony™ Cozy Cart Cover ™ is designed to cover the whole cart. This makes a clean space for my little guy to sit. The fabric is padded and it fit well over the shopping cart. There is even space to link up toys. The cover uses the shopping carts own straps that slip through the cover. Best of all it is machine washable! 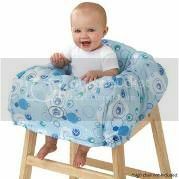 Comfort and Harmony Cozy Cart Cover: Provides 360° of protection for your little one! The Comfort & Harmony™ Cozy Cart Cover™ is made of plush, padded fabrics for supreme comfort while protecting baby from germs in shopping carts or restaurant high chairs. We only used the cover at the store shopping and haven’t tried it on a restaurant highchair. Jace enjoyed being able to sit up and see what was going on which was a plus during the shopping trip. I really like the coverage it provided. Comfort and Harmony Cozy Cart Cover retails for around $29.99 and can be purchased directly from Brightstarts.com. I received this product to review for AsTheyGrowUp.com.This is solely my opinion. Other people may have different experiences with the product. Thank you to Bright Starts for providing a product to test.